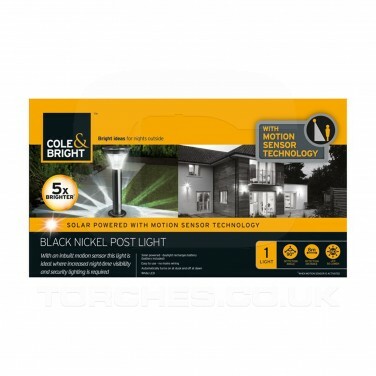 This stylish black nickel solar post light is motion sensitive and so is ideally suited for highlighting garden pathways, driveways and patios giving extra bright illumination at night. Five times brighter than than standard solar garden lighting, this modern post ligh has an output of 50 lumens on motion sensor function detecting movement within an 8m range. Allow to charge throughout the day and this light will sense darkness to automatically switch on at night, and then when motion is detected a second LED will light to give extra visibility in your garden. 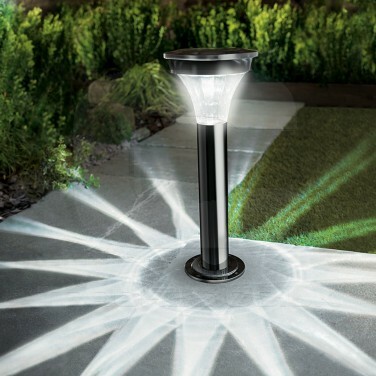 With a sturdy screw in base and no wires, this solar post light is ideal for garden location with a strong, secure stance that requiring no mains wiring.